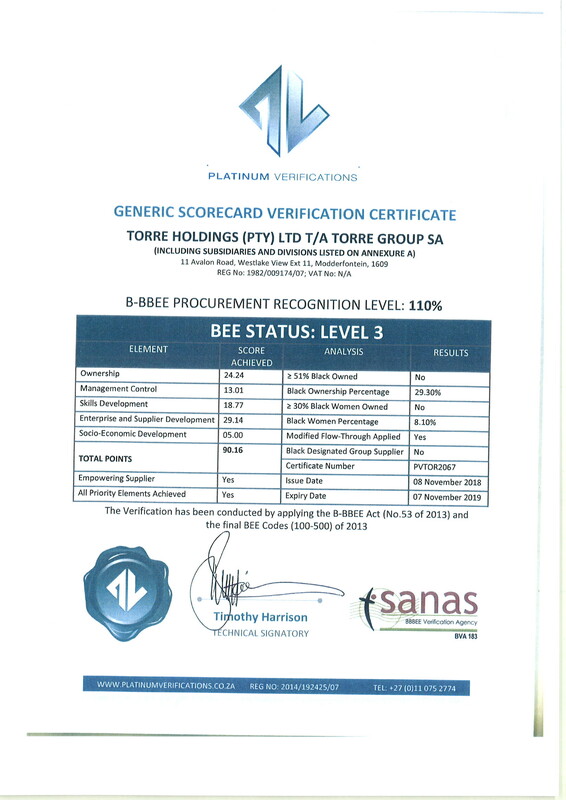 JSE listed industrial group, Torre Industries Limited is proud to announce its recent improvement to a Level 3 BBBEE rating. “Torre values and actively promotes transformation and we are pleased that we have reached the next level,” says Kehumile Setiloane, Group HR Executive. 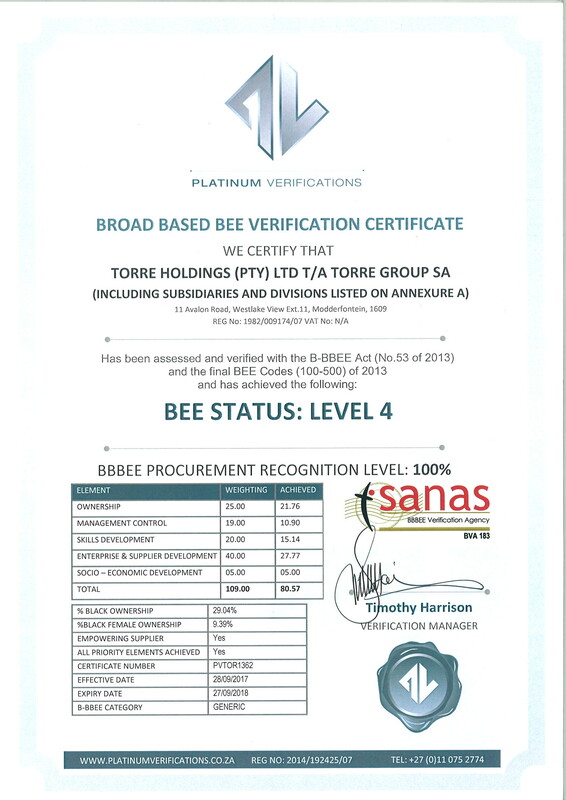 Becoming BBBEE compliant is a long-term goal and Torre has been aggressive in terms of its approach towards acquisitions since it listed on the JSE in 2012. “We’ve had to work hard at aligning each new business unit with our integrated framework of strategy, policies and legislation in order for our transformation goals to be achieved and sustained,” says Setiloane. The remaining three business units which fall within Torre’s Analytical Services offering have achieved Level 2 status, making up 33% of the business. “With the entire business now at Level 2 and 3, we are another step closer to promoting inclusive and sustainable economic growth in South Africa,” says Setiloane. Torre is also improving its HR scorecard by promoting and fast-tracking development and advancement of designated group employees into executive, senior, middle and junior management roles. The Group is also sustaining and improving supplier diversity by putting procurement strategies in place for new business and suppliers. “This is a fairly young business that we have positioned for sustainable long-term growth in the industrial sector – and these BBBEE achievements are testament to how critically we view the shared value concept and the principles outlined in the BBBEE Act,” says CEO Jon Hillary. “We will continue to prepare and work on attaining the highest levels on the BBBEE scorecard – as it is a critical part of our long-term plan to be a sustainable business that actively participates in the real economic transformation of South Africa,” says Hillary.